At Time Out for the next 2 weeks we are CASEing (copy and share everything) the very talented Ardyth. I have been a long time fan of Ardyth and have many times CASEd her cards. I love her graphic CAS style and was honoured she agreed to be our CASE designer for Time Out. 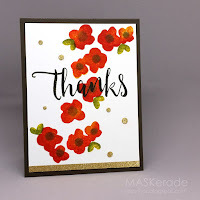 Have a browse around her blog Maskerade-you will love what you see. I am sure you can see I followed the layout of Ardyth's card just swapping it around and replacing the flowers with snowflakes-all from CAS-ual Friday Stamps I also used all her colours except the green. I added gems and enamel dots rather than stamps. And I stamped a gold strip at the side instead of glitter card at the bottom. Stamping the gold strip was a huge task to get straight...misti I need you!! I loved making this card. I was so inspired by the CASE card-a huge thank you to Ardyth both for joining us and for continuing to inspire me. For this challenge our 2 new DT members Stephanie and Jennifer join us for the first time and we say good bye to Elizabeta who has been with us since we began Time Out two and a half years ago. Welcome Stephanie and Jennifer we look forward to creating with you. Goodbye Elizabeta, thank you for inspiring us from day one-you will missed. Our Guest Designer for this challenge is my teamie from Inkspirational, Marina. Marina is a fabulously creative designer. Take a look at her blog My Perfect Life and you will see so many inspiring projects. I have admired her creativity for many years now and am very excited that she is our GD for this challenge. Time to take a look at what the DT have created for you here. 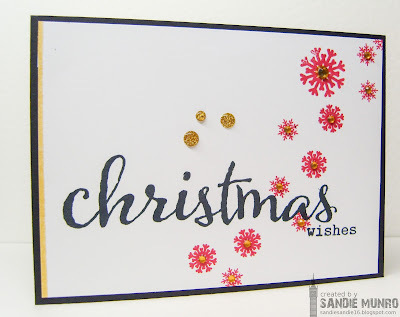 CAS-ual Friday Challenge-1 in 8-all snowflakes are CAS-ual Friday stamps and more than 8! Sandie, I just LOVE the flowers turned snowflakes! Red snowflakes at that!! Love your gold enamel dots too. I wish I had put the gold strip on mine... looks fabulous Perfect CASE of Ardyth's wonderful card! Great CASE of Ardyth's card, very pretty! Love that you 'winterized' my very autumn card! Very festive! Thanks so much for inviting me to be a Guest at Time Out! What a fantastic take on Ardyth's card. Your snowflake/flowers are so very pretty, and each one is perfectly placed. Fabulous case, Sandi! That Cas Christmas card is divine! I've probably said this before, but I like how you do snowflakes in different colors. Mine seems to always end up traditionally white, or when I'm feeling daring they're silver, lol. I've still got some boundaries I should cross. I do like this one, Sandie. Love that you made your card a Christmas card! Perfect colors for it! Lovely design too! I have those snowflakes Sandie - what a great idea using those instead of flowers. Such a pretty take on Ardyth's card! Thanks for playing along at CAS-ual Fridays! Beautiful card!! I love all your details! Thanks so much for joining us a CAS-ual Fridays! So pretty Sandie! I love how you bling-ed up the snowflakes with the gems - adds the perfect Christmas sparkle! Wonderful CASE!